In what was once a killing field during the Pol Pot regime, there's a memorial to the people who were executed by the Khmer Rouge. 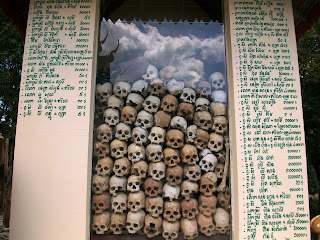 It is believed that as many as two million people were killed and their remains left in one of many killing fields throughout Cambodia. Wat Thmey, a monastery with a large temple, is located on that killing field in Siem Reap and within its grounds is a collection of skulls found in the area. They say that after heavy rains, teeth and human bones rise to the surface and these would be gathered by locals and laid to rest in the glass fronted stupa within Wat Thmey.